Seriously. This map suggests that unless you live in California, a smattering of states out East, or a small handfull of other states sprinkled across the country, you're looking at a very grave problem when it comes to scientific illiteracy in your community's youth (and, presumably, its population in general). Come to think of it, this map should really concern you, no matter where you live. Some have called this diagram, recently published in a report by the Thomas B. Fordham Institute, a grim portrait of state science standards in the U.S. But this goes well beyond grim. This is downright bleak. Standards are the foundation upon which educators build curricula, write textbooks and train teachers– they often take the form of a list of facts and skills that students must master at each grade level. Each state is free to formulate its own standards, and numerous studies have found that high standards are a first step on the road to high student achievement. That last bit should be a point of major concern for every person in the country, because as the report notes, a shocking majority of the states' standards are in fact "mediocre to awful." 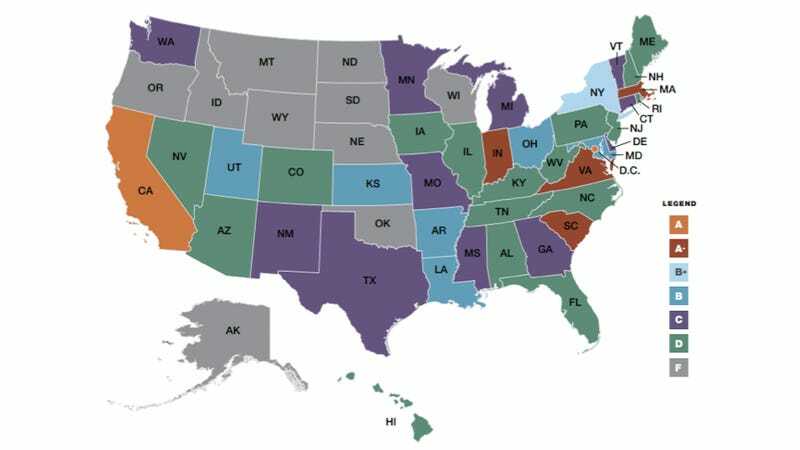 We're talking about purple, green, and grey states, here [click for a bigger version of the map]. States like Tennessee, where, according to the report, "half the biology course options in high school do not entail evolution." But the undermining of unifying scientific concepts isn't the only hurdle the country is facing. The report also calls attention to vague goals, a shoddy implementation of the concept of scientific inquiry into lesson plans, and a lack of instruction in mathematics, as well. At least 26 states have signed on to an effort to write new, common "Next Generation Science Standards" that will be more rigorous and specific than what many states currently have on the books. To read more about that effort, visit http://www.nextgenscience.org/ or http://www.achieve.org/ or read the document upon which the standards will be based here.